Ah, to have a crystal ball and see this future play out. Or better yet, to be a character in the movie Back to the Future. Also about futuristic cars, I might add. For example, EV manufacturers, utilities that can better monetize sunk costs in power generation assets during off-peak hours, battery makers, NGOs working to protect human health, or lithium and other precious metal supply chains. For example, major car manufacturers, government leaders concerned about falling revenues linked to gasoline taxes, utilities unable to manage peak power challenges, or...um...the oil industry. There is no agreement on how, when, or if EVs will come to dominate the transportation sector. And importantly, the same metric used for these EV projections is often not the same. Even trickier is the fact that calculations from various sources do not use the same year for the end state. Some use 2030, others 2040, and...well...you get the idea. It’s almost intentionally confusing so as to prevent an apples-to-apples comparisons among different EV projections. So, here are five things to keep in mind regarding the “all over the map” nature of future EV growth. No one is perfect, and all estimates of future EV growth are wrong. As such, credible sources for these data frequently offer updated projections. The US EIA’s vision for EV sales three months ago is 2x higher than one year ago, and 10x higher than its estimates from ten years ago. It’s also worth stating the obvious: The disruptive nature of EVs is significant enough that non-transportation management consultancies and big banks like PwC, Deutsche Bank, Deloitte, and BCG are spending time making forecasts to win new business in the sector. It’s not uncommon to hear the term “death spiral” in reference to utilities who face increasingly tough competition when electricity from solar plus storage becomes cheaper than grid power. But those statements, sometimes deemed hyperbolic, tend to come from renewable energy proponents. Biased, one might say. This time, it is instead coming from Fitch Ratings, one of the big three credit ratings agencies. And despite very conservative EV projections from BP and OPEC (see below), many oil executives are aware of EV’s impacts on the sector, and are, in part, noting a decline in oil demand starting in the late 2020s or early 2030s. But note: Though there are still critics who believe the coming EV tidal wave is totally overblown. Here is a good counterpoint from the Financial Times. As you can guess, the potential for errors increases as the length of time in the projection increases. So, how do projections for EV penetrations vary for 20 years in the future? And how about projections for EVs as a percentage of all new car sales? But that can be the sign of a sector that presents opportunities for above-market returns. Consider the microwave, dishwasher, cell phones, refrigerator, internet, VCRs, or computers. They are not perfect comparables to a vehicle, but suspend disbelief for just a second. 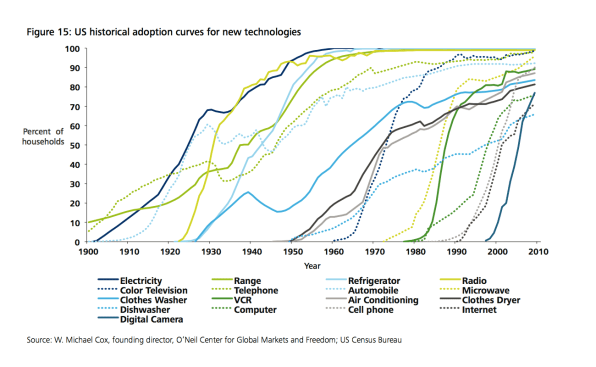 These technologies often went from zero to 80%+ market penetration within about 25 years after their initial 1% market adoption (i.e., roughly where EVs are today). This graph shows these trends well. When it comes to predicting the future role of EVs in the transportation or energy sector, no one is right. However, it’s a little bit like deer hunting with a bazooka. It doesn’t require the precision of a bow and arrow, so odds are you’re going to be putting some free range meat in your freezer after that trip to the great outdoors. Translation: Abundant opportunities exist for entrepreneurs, large corporates, and investors in the EV market in the short and long term. As the Chairman of Bloomberg New Energy Finance noted recently, with 100+ EV models on the road within three years, EVs will make internal combustion vehicles look old fashioned. Founder & CEO, Resispeak, Inc.
What do you do within the renewable energy sector and why is it essential? I have two main activities in the renewable energy sector. My company, Resispeak, develops and licenses utility bill collection and analysis software. Resispeak has analyzed energy usage data on behalf of home energy efficiency programs, electric utilities, building portfolios, and others in order to make their energy management initiatives more effective. My consulting practice, Terracel Energy, provides clients (consulting firms, large corporations, investment funds) with advisory services such as energy technology evaluation and market intelligence. Some of these clients make substantial commitments in the energy sector and I inform their capital allocation processes as objectively and insightfully as I can. Can you describe 2 of your most impactful past projects or engagements? Resispeak is currently participating in a DOE-funded grant whose purpose is to develop a software tool that improves the ability of energy efficiency programs to serve their local communities, with a focus on five counties in eastern North Carolina. Terracel Energy recently led a technical due diligence on a highly innovative and speculative renewable energy generation technology, leading to an investment as part of a significant funding round. What are you most excited about for the renewable energy industry in 2017-2018? Energy efficiency has always been a neglected stepchild of the energy sector and remains an intractable problem due to its complexity. In the spirit of Eisenhower’s famous quote that “if a problem cannot be solved, enlarge it”, we are beginning to see the emergence of software applications whose purpose it is to connect residential energy efficiency development with other initiatives whose goals differ but whose activities overlap, such as poverty alleviation, weather resilience, and indoor air quality improvement in support of healthcare cost reduction. This comprehensive approach may create meaningful forward momentum towards comprehensive energy efficiency strategies and perhaps even innovations in energy efficiency investment as an asset class. What are you most concerned about for the renewable energy industry in 2017-2018? My biggest concern is that with cost-effective renewables and low natural gas costs in North America, energy efficiency will remain a significantly neglected option. The business cases for energy efficiency are already often marginal, and with low natural gas and wholesale power prices it can be difficult to make the math work. My other big concern is that we will terminally loose the desire and then the ability to deploy large new nuclear power generation. New reactors in Georgia and South Carolina are experiencing cost overruns on the order of a billion dollars a year per reactor, and unless we can demonstrate that new nuclear is cost effective to develop we will loose any remaining appetite for new nuclear power generation, at least in the U.S.
What is one trend in the renewable energy sector that few are paying attention to? At the end of last year, NuScale became the first company to submit a reactor design certification application to the U.S. Nuclear Regulatory Commission for a small modular reactor (SMR). Unlike large site-built reactors, SMRs would, in theory, be constructed in a factory and shipped to site, thereby taking advantage of manufacturing economies of scale. More than a dozen companies are pursuing SMR commercialization with a wide range of designs. Clearly not all of these companies will succeed, but our best chance for ensuring a role for nuclear power in our energy future may come from SMRs, so look out for advances in this space. Why is good energy analysis important? If we are trying to reduce a community’s total winter heating costs, we should know how much energy is being consumed for winter heating, and by whom. If we are optimizing a building’s operation, we should observe trends in energy usage from the smart meter data. If we are investing in energy efficiency, we should measure how much energy we are saving. However, very often we do not take these straightforward actions, resulting in wasted money and energy. Proper energy management at any level begins with proper energy analysis, without which energy managers and other decision makers are essentially flying blind. What has surprised you most about your career in the renewable energy sector? What has surprised me most is how hard it can be to commercialize new energy technology. In an article I wrote about a couple of years ago and published in GreenTech Media, I remarked how innovative energy technology often competes against something that currently exists and already works well. A better mousetrap is rarely enough – doing something innovative in the energy sector generally requires not just technical innovation but also financial innovation, organizational capabilities, and a network of partners that share a common vision and are willing to collaborate on implementation. What are 1-2 pieces of advice you would give someone thinking about entering the renewable energy industry today? Renewable energy is a very rewarding and intellectually stimulating field to work in, but it can also be quite frustrating due to the extent of regulatory, economic, and technical challenges that need to be overcome to make a real impact. If you are exploring opportunities in the renewable energy industry, my advice is to be sure to budget realistically and ensure others do so as well, since projects often take longer and cost more than optimistic proposers would otherwise hope. Quantified Ventures is leading the way in applying the ‘Pay for Success’ model to the environmental sector. We recently helped the DC Water and Sewer Authority issue the nation’s first ‘Environmental Impact Bond’ to fund implementation of green infrastructure, and are working to apply this approach in addressing other environmental issues such as in agriculture, forestry management, fisheries, and energy. Quantified Ventures strongly believes that the Pay For Success model can be used to de-risk public investment in renewable energy and look forward to pursuing such transactions in 2017-18. What is the role of impact capital going to be moving forward? There is now $16B in ‘Impact Capital’ available for investment to scale innovations that will make a difference in the world. All the major financial institutions, plus foundations and high-net worth families have Impact Investing units that are an attractive source of capital for companies that can deliver both financial and social returns. Jump in and innovate on Day 1 to advance/scale what works and shed what doesn’t. EIP provides insight, expertise, and operational support to startups and large corporates alike. Our backgrounds allow us to not only support innovation, but also financing, growth, and strategic decision making. This full “life-cycle” experience gives us the ability to make recommendations, but then, if needed, step in and help execute on a day-to-day basis to make those recommendations realities. We were engaged by one of the world’s largest R&D organizations to help build a business model around a new grid-edge technology they had developed. Initially, we helped assess the opportunity and delivered go-to-market recommendations. As the engagement evolved, we were asked to become more and more involved resulting in us helping to spin out a new company. I took the role of CFO and VP of business development of the new entity, helped secure several million dollars in seed financing, signed the first two large customers as we deployed the technology in a commercial setting. Being able to not only identify the opportunity, but also help execute, is very rewarding. In a more challenging situation, we were engaged by an investor with a large interest in a project that was not going as planned. They realized they needed not only financial support, but also energy and project expertise to totally understand their risks, opportunities and options. We were able to accurately assess the situation both operationally and financially, quantify the risks and opportunities within the decision matrix, as well as provide new options that were previously not available. Having investment, operational, and technical experience from financing and operating power plants allowed us to provide a one-stop-shop to resolve this difficult situation. Non-battery energy storage. We are seeing a lot of innovative ways to store energy at well below the cost of batteries and there are lot of very smart people developing the technologies to leverage these novel approaches. We have helped groups take advantage of these resources and leverage utility tariff structures to save significant amounts of money. This trend will only grow, and it could be a game changer for the power grid and the environment. The pace of innovation is far outstripping the grid’s ability to understand and incorporate it. The result is often a reluctance to test and implement new technologies, or a sporadic deployment that has suboptimal results. Energy decisions often have very long term implications. For example, for every gas plant that is built instead of implementing demand side management technologies, we lose years of potential cost and performance benefits. We see massive changes happening as technologies are being deployed that allow consumers to manage when they use electricity which the grid must deal with. Biofuels and biomass. This sector has been really beaten up over the last 8 years, after being the darling of the clean tech revolution. Much of the failure of the sector was a poor understanding of the challenges beyond just the technology. We have a lot of experience in this sector and have seen a number of new ideas that could make the promise from 8 years ago a reality. If you asked one of your early stage clients what they value most from an engagement with you, what would they say? Early stage companies and investors are often short on resources and time, but need expertise and execution support from professionals who understand the sector and the challenges of startups. We have found they appreciate our experience and insight into their business, and come to truly value our ability to provide flexible hand-on support as they execute over the long term. The rapid evolution of the demand side. Consumers have so many options and are impacting the grid like never before in both good and bad ways. As an example, our experience with isolated and island grids has taught us that even efficiency can have unintended negative impacts. Success in the energy sector takes a long time, so be patient. While it would be great if we could replace certain infrastructure overnight, the reality is that these are long-lived high cost assets. Having said that, hold on tight, because there are few industries as volatile. ​What do you do within the renewable energy sector and why is it essential? EIP provides expertise and operational support to clients in the energy sector. We serve startups and large corporates alike. We are differentiated by our backgrounds and the fact that we can also step in and help execute after assessments and recommendations are made. I have over 15 years of experience with energy storage technologies and markets. Assisting with investor due diligence on energy storage investment opportunities is always impactful. I recently supported an investor group as they considered investing in a new energy storage technology. In these cases, I’m able to leverage my technical, startup, and investing experience to identify the key risks and provide feedback on the technology, market, and deal terms. This is particularly helpful for groups new to the energy storage space. Another impactful engagement involved a client that needed help assessing the opportunity for a new energy technology developed in-house that was complementary to their core business. We determined three commercialization options, ultimately focusing on one market that was an ideal fit based on the client’s technology, capabilities, and goals. EIP also developed and secured two strategic partners for future joint ventures, and even procured strategic partner hardware for preliminary testing. We see a lot of market dynamics that others do not because we are working with clients every day that are striving to disrupt markets. What most excites me is that the way we consume and produce energy is changing fast thanks to the convergence of low cost hardware, a fast and robust communications network, and smart devices behind-the-meter. We are witnessing the start of new distributed energy infrastructure that will ultimately make our energy mix cleaner, more efficient, and more stable. It’s happening a lot faster than people think, and with change there is opportunity. I’m most concerned that there is a looming shake-out in the energy storage industry. There is so much OEM competition and pricing has dropped so quickly that I suspect many companies will exit the sector in the next few years. Also, I’m concerned that the energy storage industry’s reputation may suffer a setback because expectations are so high. It’s time to deliver on the promise. Few people are paying enough attention to the fact that the regulatory and policy frameworks that utilities operate within are not keeping up with energy innovations. This is going to make it more challenging to manage the grid in the short-term because behind-the-meter assets are being rolled out at an increasing pace. Electricity consumers are benefiting at the expense of the utilities, who will continue to lose visibility, control, and revenue. Established business models are also at risk because utilities will start changing the rules of the game. Why would a large corporation engage EIP rather than a larger, traditional consulting firm? Our boots-on-the-ground experience provides large corporate clients with assessments and analysis from a real-time market perspective. As an example, we work with early stage companies on a regular basis and see market changes first-hand and often before others. The insights we have from these experiences are highly valuable when large companies are making important strategic, product, and go-to-market decisions. I am surprised how much attention energy storage has garnered over the past three years and how much and how fast lithium ion battery prices have come down. Come to the industry with an appreciation of the enormous infrastructure in place and the scale of the industry. It is very challenging to introduce disruptive energy technologies and business models. However, there are a lot of market inefficiencies and thus opportunities. The storage market is projected to grow over 100x from 2013 to 2022. That’s great. Let’s go celebrate. When it comes to battery storage, that “future” today is defined as Hawaii, California, and the Mid-Atlantic (i.e., PJM power territory), with some random outliers such as Kentucky and Michigan as well. However, the financial feasibility of energy storage will grow quickly. Analysts project that commercial storage pencils today in 7 states. But that number is projected to rise to 19 U.S. states by 2021. Battery costs are, of course, a key driver. So let’s consider four trends for investors to keep in mind. Capital costs get most of the attention in discussions about energy storage investment opportunities. However, capital costs are not the only consideration in achieving an attractive IRR. Is value greater than cost? As the Lazard figure below illustrates, when “stacking benefits” from energy storage projects, more and more project opportunities will begin to make financial sense. These benefits, or potential revenue streams, can include grid benefits (e.g., regulating frequency, deferring major capital cost upgrades) as well as host-user benefits (e.g., lowering demand charges on power bills). Unfortunately, policy and technology are still barriers to the realization of multiple sources of revenue for the same storage system. Both are slower to adapt to market possibilities than entrepreneurs and investors would like. Furthermore, if you’re coming from the wind or solar industry, it’s helpful to remember that energy storage is not an industry where one size fits all. There is not one energy storage market. There are many. According to a 2015 Moody’s report, energy storage costs have fallen by half in the last six years. They predict “significant market impacts” for power producers. But even greater costs reductions have been seen in recent months. For example, over the 18 months prior to June 2016, energy storage provider Stem saw a 70% reduction in their costs for batteries. The falling prices can be attributed to a number of factors, such as the overall scale of production among all manufacturers, the volume of production on an individual company basis, and the balance of supply versus demand. First, be aware that storage cost projections vary depending on the technology (e.g., lithium, flow, flywheel, sodium, zinc, compressed air) and the use case (e.g., commercial, residential, microgrid, island grid, transmission-level, peaker replacement, frequency regulation). Below is a snapshot of expected storage price drops on an annual and five-year basis. The outlier, not included in this chart, comes from Telsa. (Are you surprised?) Its Nevada-based Gigafactory is expected to drive down the costs of its lithium-ion batteries by at least 50% by 2020. First, let’s be clear: We’re just talking about lithium-ion batteries. First, lithium batteries will fall, in part, because EV sales have increased dramatically in the last five years — a nearly 600% increase in annual sales between 2012 and 2016. Furthermore, EV sales are poised to grow more significantly in the years ahead. BP predicts 100 million EVs by 2030, for a 6% market penetration, while other analysts project 15% to 35% market penetration, where EV sales account for 8 out of 10 new car purchases. Like U.S. Marine drill sergeants, EVs demand a lot from their batteries. Once the battery capacity gets below about 75%, the EV needs a replacement. But the battery still has lots of useful life in less intensive applications, such as stationary uses serving the grid, industry, or homes. Car companies like BMW and Nissan are already working on second-life uses for their EV car batteries for the home storage market. It seems like an obviously great idea — preserve that supply-constrained lithium, don’t throw away a perfectly good technology, and most importantly, get cheaper batteries for the masses. How do you combine used batteries from different manufacturers? Or those from the same manufacturer but made in different years with different technology? How do you assess useful remaining battery life in a non-invasive manner that doesn’t destroy part of the battery in the process? How do you ensure safety? And get relevant warranties and insurance needed for selling thousands of second-hand systems? Energy storage costs have fallen about 50% since 2010, and are projected to fall another 25-50% by 2020. That said, costs are not the sole determinant of investor interest. The value of storage systems is severely constrained today because policy and technology has not yet enabled the potential multiple revenue streams from the same under-utilized storage systems. So, will you dip your toe into the energy storage market today? Or will you wait for it to make progress on its 100x market growth trajectory between 2013 and 2022? How do you feel about the risks today versus the risks tomorrow, when there are far less technology and policy challenges, but far greater competition to invest in the best projects? My work focuses on law and policy analysis for renewables and other clean and emerging energy technology sources. It is an extraordinarily exciting time to be working in this area. Law and policy for renewable energy are moving fast; they need to. The sector is rapidly evolving, and the old rules of the game are quickly being changed. Last year, Sanya Carley and I conducted an assessment of the factors that led to changes in the net metering laws in Nevada, compared against other jurisdictions that have considered moving away from net metering but decided not to. This work has been very useful, I think, to those concerned about what is going to come next in rooftop solar, and where possible solutions might be found. I have also provided analysis to the Korean government about green growth as well as about how feed-in tariffs and renewable portfolio standards function. That experience was very rewarding. Opportunity. I think that’s what this year holds first and foremost. There is opportunity emerging at every turn as prices for different technologies continue to fall, as the public becomes increasingly interested in participating in the energy sector, and with the promise of new infrastructure across the nation. States like Nevada are looking to build electric vehicle corridors. Rooftop solar has transitioned from a minority position to a major player. And there are so many more opportunities that are only now emerging or are about to. In these and other opportunities that we cannot yet see, there is significant potential for the renewable energy industry to contribute—to change the way we make energy, to improve the security of our nation, to help forge new paths forward. For those of us who work in the industry, that makes these very exciting times. Our task is to capitalize on these opportunities—to be leaders and innovators. Uncertainty. We already were living in quite uncertain times, and that uncertainty has only heightened as the new administration has assumed office. Conventional wisdom is that national efforts to curb carbon emissions are likely to be allayed—or evaporate—but exactly how and when that will happen remains to be seen. At the same time, energy is often a more bipartisan issue in Washington, D.C. than other topics, so there is good chance there will be federal legislative movement on energy this year. Meanwhile, the states have been very active in their own right, and I only expect that to continue. While uncertainty is always difficult to deal with, it also opens doors for new and innovative solutions. So, while the uncertain times of today of course concerns me, I remain eager to help find those solutions going forward. Breadth and diversity. I think many people view the renewable energy industry as one particular thing, when in fact that is not true. Both the scope and the differences within the industry are wide, and important. Renewable energy is not just wind or solar or distributed generation. It’s that but a lot else as well, including large centralized projects, storage, and a million other imminently creative solutions that are not receiving adequate attention, are just emerging, or are not yet discovered. Why does renewable energy law and policy matter? I can’t emphasize enough how important it is that every part of the renewable energy industry works together. What this industry is really building is a massive, new, emergent ecosystem. So law and policy cannot get lost in that mix, just as finance, engineering, sales, and every other part of the industry can’t be forgotten. It all goes together; it all relies on each other. Law and policy set the ground rules for the game—and they can and do change, and can be influenced by those who must play within their constraints. In my prior career, I represented (usually large) investor-owned utilities. That knowledge is extremely useful, because the clean energy industry is growing in a world that the historical vertically integrated utilities created. There is also much room for synergies between that part of the energy industry and the renewable energy industry itself. Synergies matter. And they are available. Buckle up. It’s a fun ride, but there is no question you’ll go fast. In many ways, what we are working on today is really a project in building the future.